Carrie Fisher feels terrible for drawing attention to Harrison Ford's private life by going public with their affair on the set of the first Star Wars movie. The 60-year-old details her three-month extramarital affair with Ford in her new book, The Princess Diarist, which features entries from her old journals, revealing they were more than just friends while shooting Star Wars: Episode IV - A New Hope in 1976, when she first portrayed Princess Leia at 19, and Harrison took on the role of Han Solo. The confirmation of the fling emerged after decades-long rumours, and Carrie is stunned by the stir her remarks have made. "I'm surprised at the reaction...," she explained on U.S. breakfast show Today. "I don't think it (the affair) is that surprising. A lot of fans did think about it for a while and they made up 'Carrison' as a word (for the couple) and (asked), 'Is Carrison real?' So that was going on for a while." The "intense" romance reveal was all the more controversial because it suggested Harrison, who was 33 at the time, had cheated on his then-wife Mary Marquardt, the mother of two of his kids. 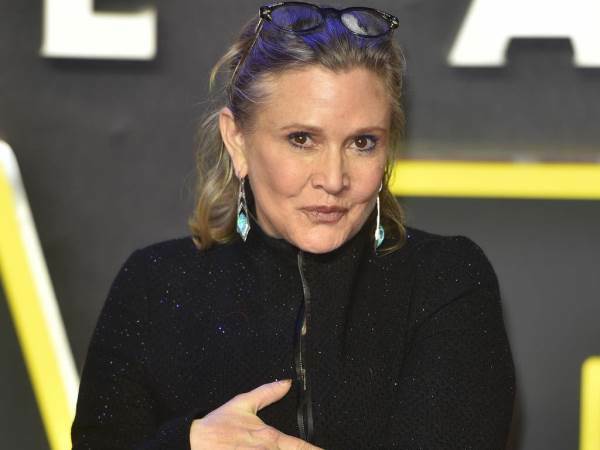 Carrie gave Harrison a heads-up about her memoir, but he has yet to publicly comment on the affair - and the actress has a feeling the famously low-key star doesn't appreciate the unwanted attention. "He's incredibly private," she said. "I feel really bad doing that to him." Asked if she was "in love" with Ford during the relationship, she replied, "Well, I was 19. So, yeah. I was not sort of a cavalier-type person." But she isn't proud of the affair: "I wasn't raised that way," she insisted. "But when you're on location, this is something I discovered, everything is permitted." And Carrie claims reading her old diary entries didn't exactly fill her with joy, either: "It was sad because I was so insecure (as a teen) and it's very raw," she shared. "Obviously I didn't expect anyone, including myself I suppose, to read it (years later)."